Bake delectable pies to perfection with a trueseasoned Cast Iron Pie Pan. Cast iron creates even heat distribution giving you a golden brown crust every time. Decorative handles have been added for convenience. Dutch oven cooking allows you to prepare the heartiest meals that are only achieved with cast iron cookware. Use this 12quart, 16 inch Dutch oven for your family favourite recipes. 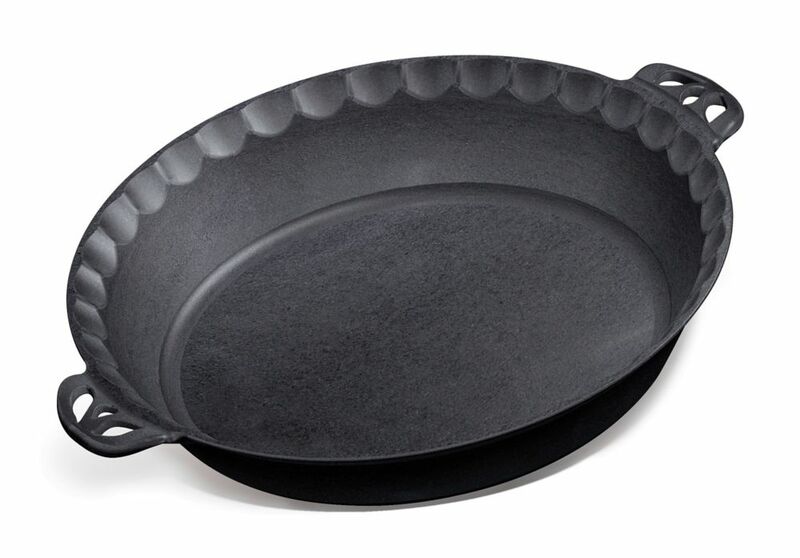 This cast iron piece has a flange on the lid making it excellent for cooking with charcoal briquettes or wood. Best of all, each piece of our cast iron cookware comes pre-seasoned with our True Seasoned Finish, providing a natural, easy release surface that is ready to cook on. Add this oven to your Dutch oven collection today. Create delicious meals and desserts with these 7 inch Mini Skillets. Perfect for making you favoirte cookie recipe, or trying something different with individual mini pizzas.The comfort grip handle ensures easy lifting and additional control. Seasoned with Camp Chef's True Seasoned Finish these skillets have a natural surface that is ready to use out of the box. Cast Iron Pie Pan Bake delectable pies to perfection with a trueseasoned Cast Iron Pie Pan. Cast iron creates even heat distribution giving you a golden brown crust every time. Decorative handles have been added for convenience. Cast Iron Pie Pan is rated 4.9 out of 5 by 9. Rated 5 out of 5 by Longsnowsm from Very nice deep dish pie pan, but is quite large I just purchased this pie pan with the intention of using it in my new camp chef dutch oven that I ordered at the same time. I bought the 9 quart dutch oven thinking it would work with this pie pan. Both items arrived at the same time and the quality is good, certainly as good as my Lodge cast, but not as nice as my heirloom cast in finish quality. Well I was disappointed to find out that the pie pan will NOT fit in my dutch oven. The quality of the pan is nice enough I decided to keep it anyway and it will get used for other things, and for cooking in the oven in the house. So the quality of this item appears quite good. I think this probably would have fit in the dutch oven I bought if not for the handles on the sides of the pie pan. It would have been a tight fit even without the handles. Overall I can recommend this pan, but do not recommend getting it to fit into the 9qt dutch oven. It may well fit in the larger 12 quart dutch oven. I don't have one of those to size it up so I am unable to confirm that. Overall this is a nice pan, I only wish I had ordered the next size up in the dutch over and that it had fit. Rated 4 out of 5 by Pie baker from Lovely pan - if treated properly This cast iron pie pan was exactly what I was looking for and at such a great price! While it does come pre-seasoned, be careful not to let it drip dry or it will rust.. Re-seasoning removes the rust but after every use I rinse it with hot water and dry it on the stovetop or in a warm oven then rub in a bit of shortening. Rated 5 out of 5 by Happy from Amazing! This makes the best pies of ANY pie pan I've EVER used... get one... or two.. you won't regret it and you don't have to use it just for pies!! Rated 5 out of 5 by Merlyn from very satisfied Perfect size and not to heavy. Have already made a pecan pie and last night made a beef pot pie in it. Came out perfect. Had enough left to give a plate away and left over for another meal. Rated 5 out of 5 by Hambone77 from Nice pan overall This pan makes great pies and cornbread. Love it. Cooks great. Rated 5 out of 5 by Anonymous from The best pie pan ever This is without doubt the best pie pan we have ever used. It cooks the crust of the pies evenly and completely without any burnt or doughy places. The pie itself comes out perfect. I will probably buy another two in the near future to replace our other pie pans. The very first pie we baked in it was amazing. I would give this product my highest recommendation. Rated 5 out of 5 by grandyma57 from As good as my mom's frying pans I bake alot of pies and in glass, aluminum or porcelain, part of the crust is usually doughy, but with this one my pie crust came out evenly browned and flaky like it should. It is the perfect size, washes up with just hot water, does not rust, but I dry it immediately and put it away. I plan to buy at least 3 more pans so all of my pies will be perfect. I love this pie pan.